In August of 2014 my wife and I moved back to Vermont and bought an 1890 Victorian on Elm Street in Montpelier. Like many Vermont homes, it is a beautiful old house with a lot of character -- but it was also very leaky and outdated when it came to efficiency and energy use. Our first year in the house we consumed over 1,000 gallons of fuel oil for heating (space and hot water), at a total cost of nearly $2,400. And that was while setting the thermostat for our forced hot air oil furnace in the low to mid 60’s through the winter. We found ourselves in a situation where we were using a dirty, polluting fuel that we didn’t want to use, paying more than we could afford, sending that money out of state (approximately 78 cents on every dollar spent on fossil fuel leaves Vermont), worried about the health of our young son given the air quality concerns for old forced hot air systems with rusting, asbestos wrapped ductwork, and we were never even really that warm or comfortable during that first winter. The first step was to have an energy audit performed so that we could understand just how leaky our house was and to identify the biggest culprits of air leakage/heat loss. We worked with Energy Smart out of Barre. The blower-door test they performed on the house gave us an air leakage rate reading of 5,000 cubic feet per minute (CFM50)… in other words, pretty leaky. We also have a 600 sq. ft apartment above our garage, which is newer construction and proved to be much more efficient. The audit showed that the biggest air leakage culprits in our house were our basement/foundation and our attic. Part of the problem in our basement was that a portion of the foundation that had been falling away, leaving some cracks for air to escape. So the first, obvious step was to have that repaired. We then had our basement spray-foamed and had blown-in cellulose put into our attic. After this work and various other air sealing measures (spray-foam above an office ceiling, a new basement door below our bulkhead, weather-stripping, etc. ), Energy Smart performed a second blower-door test, finding that air leakage had been cut in half, down to 2,500 CFM50. Note: Energy Smart later submitted this project to Efficiency Vermont’s “Best of the Best” awards program, and it was given the “Honor Award” for the best whole-home efficiency retrofit in the $10,000 - $20,000 range in Vermont in 2015. Next came fuel switching. My first choice would have been to install an automated wood pellet central heating system. However, I found that, at the time, it was more expensive to convert a forced hot-air/furnace system to run on wood pellets than it was to convert a radiant heat/boiler system to run on pellets (today there are more options for wood pellet fueled hot air furnaces). I grew up with a wood stove and missed having a heating source that both connected me back to our Vermont working landscape and that could also truly warm you up to your bones in the dead of winter. However, my wife was less than enthusiastic about having me lug cordwood through the house, making a daily mess. So we compromised on a wood pellet stove. We bought a Hearthstone, made in Morrisville, and we have exclusively used Vermont-made wood pellets (first, Green Mountain Wood Pellets, made at the Renewable Fuels of Vermont mill down in Windsor for the first two years, then Vermont Wood Pellets made in Clarendon starting in the Fall of 2017). While the 50,000 BTU stove was advertised as only having a comfort rating for 2,000 sq. ft. of space heating, it comfortably heats our whole 2,400 sq. ft. house because of the efficiency improvements that we did and the reduced air leakage they achieved. Thus far, we have kept our fuel oil furnace as a backup source of heat (primarily for when we are not home to load the pellet stove). Each of the last two winters (2015/2016 and 2016/2017) we have heated the whole house with approximately 4 and a half tons of wood pellets and 100 gallons of fuel oil, at a cost of less than $1,400: a $1,000 annual savings from our first winter in the house, all while being warmer and more comfortable. We also decided to replace our old water heater, which was using fuel oil, with an electric heat-pump water heater. Surprisingly, even after making this switch which added to our electric usage, our electric bill has gone down over this past year, from an average of $127 for the 12 months before all of this work, to an average of $115 over the past year. My assumption is that the efficiency improvements and the switch to the pellet stove reduced the electric demand we had been generating for space heating. We have also switched nearly all of our light bulbs to LEDs, which has likely helped as well. For the apartment, we installed an air-source heat pump, which is now the primary heating source (while the propane wall heater unit has been left as a backup). Our tenant says that the heat pump heats the 600 sq. ft. space easily and comfortably all winter. The switch from propane to electric has reduced our tenant’s heating costs considerably: when the primary heat source was a propane wall heater, it used 600 gallons in 2014/2015, costing our tenant $2,000. In contrast the air-source heat pump has added an average of $40 per month to the apartment electric bill, for a cost of $480/year. While the propane wall heater still is used as a backup, our tenant saved over $1,000 in heating costs last year. Energy Audit: Energy Smart of Vermont, Barre; $450 ($350 after $100 Efficiency Vermont rebate). Energy Efficiency Improvements: Attic air-sealing and insulation; spray-applied high temp closed cell urethane two-part foam air seal and insulation system in the basement and ceiling of office; assorted other components (attic hatch dam, new insulated bulkhead door, weatherstripping, etc) ; Energy Smart of Vermont, Barre; $10,925. Note: $21,027 (Foundation repair, efficiency improvements, the heat pump for the apartment, and the electric work) of this amount was financed via VSECU’s Heat Saver Loan (unsecured, 15 yrs at 4.99%) and $7,649 (the pellet stove, its installation, and the heat pump water heater) was financed with a VSECU Energy Improvement loan (unsecured, 12 years at 5.40%). Unfortunately the latter three components of work (the pellet stove and installation and the heat pump water heater) did not qualify for the Heat Saver loan, otherwise we would have bundled all of the work into one loan. It costs us $240/month ($164 for the Heat Saver loan, $76 for the Energy Improvement loan) to repay these loans. Note: we paid for the energy audit out of pocket and did not include that in our financing. Our long term goal is to reduce our fossil fuel use to zero, across our heating, electric, and transportation energy use. To get there on the heating side, we plan to eventually replace our (now backup) fuel oil furnace with an automated wood heat pellet furnace or a ducted cold climate heat pump system. 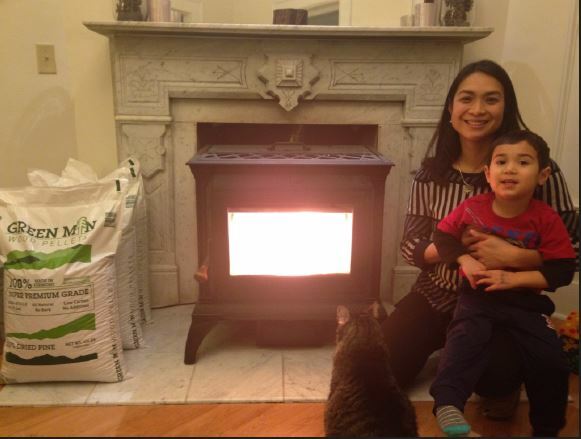 But for now, our pellet stove meets 90% of our heating need with local, renewable energy. Regarding our electric use, we originally asked Catamount Solar and SunCommon to give us quotes but they both said our home was not a good candidate for solar. However, SunRun has found a way to make rooftop solar work for us and we are currently working with them to put a rooftop array on our garage that will cover our full home electric use, with a lower bill than our current Green Mountain Power bill. Lastly, regarding transportation, after a long search for the right diesel vehicle, in 2017 I purchased a vehicle that has allowed me to cut my fossil fuel use in half: a 42mpg 2000 VW Jetta Diesel with approx. 170k miles, for $1,500. I run it on 100% biodiesel from Black Bear Biodiesel over in Plainfield from May to November, and on a 5% biodiesel blend from Bourne’s/ Kurrle Fuels in Montpelier from December to April. Long-term, I am hopeful that the cost of electric vehicles (EVs) will continue to decline and that when I get my next car, it will be an EV.